With the DocuPrint M455 df multifunction printer, you’ll get best-in-class speed1, expanded capabilities and professional-looking print quality for your busy office. With best-in-class1 speed, print resolution and media capacity, your busy office can maximise workflow and minimise waiting. Press print and the DocuPrint M455 df is off and running, delivering 45ppm with the first page out in as little as 5 seconds – the quickest monochrome print speeds in its class1. The icon based, intuitive 4.3-inch colour touch screen on the DocuPrint M455 df lets you program your next job while another is in progress. Easily turn cumbersome hard copy forms and documents into portable, digital files. Enjoy the added convenience of sharing your digital files automatically via email. You can even send your files to an established network folder or export them to a USB memory device. With the DocuPrint M455 df legal-sized platen, you can scan larger pages without disassembling your bound documents. Customise to your specific business needs with optional Wi-Fi or SD Card. Plus, three additional trays let you expand your work to fit different paper sizes and stocks, or extend media capacity during peak workloads. Enjoy quick startup and everyday operation. Plus handle device administration remotely from any networked computer’s browser with CentreWare® IS. Even small work teams can benefit from the powerful and affordable options and capabilities delivered by the DocuPrint M455 df. The DocuPrint M455 df combines the functions of a copier, printer, scanner and fax machine into a single value packed unit that can generate savings on energy and supplies costs. You’ll dramatically cut your paper usage and related costs thanks to automatic two-sided printing. Plus N-up printing saves printing costs, and lets you print multiple pages on one sheet – a useful option when sharing presentations. With optional Wi-Fi capabilities, the DocuPrint M455 df is ready to go to work wherever it’s needed. 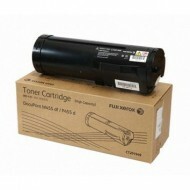 Extra-high capacity toner cartridges allow you to spend less time loading supplies and more time getting work done. No matter what business you’re in, the DocuPrint M455 df delivers images that get your work noticed. Add definition and clarity to your documents with true print resolution of up to 1200 x 1200 dpi. Your printed communications never looked better. Fuses at a much lower temperature, reducing power consumption by up to 20% and CO2 emissions by up to 35%, compared to conventional toner. Apple® AirPrint™ lets you print, email and import office documents directly from your mobile iOS device when connected to your office Wi-Fi network. And when working offsite, you can use Google Cloud Print® to print documents back at the office so they are waiting for you when you return. 4GB SD Card Expanded memory for storage of fonts and forms, and also enables TLS/SLL encryption for email communication. Cabinet (Stand) Enables floor standing moveable machine. Colour Black Yield Up to 25,000 pages @ 5% Coverage Compatibility Fuji Xerox DocuPrint P455d, Docu..
Colour Black Yield Up to 100,000 pages Compatibility Fuji Xerox DocuPrint P455d, DocuPrint M455df ..